Southwest Valley Chamber of Commerce 2017 "Swaggie" Excellence in Business Award. 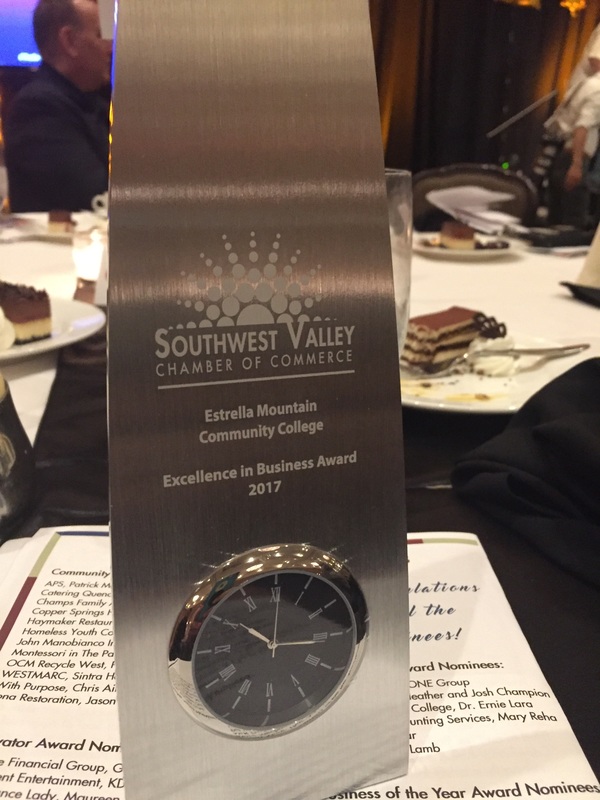 Estrella Mountain Community College (EMCC), a Maricopa Community College, is excited to celebrate 25 years as a member of the Southwest Valley Chamber of Commerce by being inducted into the organization’s Silver Club. The honor is especially significant as EMCC is celebrating its own 25-year anniversary in 2017. Throughout each academic year, EMCC strives to develop and strengthen relationships with local businesses to highlight their value to the community and to create bridges between these business leaders and the students who are studying to become the next generation of leaders that will further shape the community. Introducing learners to leaders can lead to transformative relationships for both parties, helping to build a stronger, prosperous community. As a token of gratitude for their service to the community, each member of the club receives a specially-designed Chamber coin. The gift of the coin, itself, reflects a WWI legend, where a bronze coin was instrumental in saving the life of an American pilot who was imprisoned in a POW camp. The coin verified his identity as an American and helped save his life. At the recent 2017 Southwest Chamber gala, known as the “Swaggies,” EMCC received the Excellence in Business award. Part of the Chamber’s mission is to help area businesses and organizations be successful. This award is given to recipients that have shown significant and sustainable growth, as well as marketplace excellence. EMCC is honored to be this year’s recipient of the award and credits the Chamber’s continued support as an integral part of the college’s success. EMCC looks forward to continuing this long-running relationship with the Southwest Chamber of Commerce and discovering new ways to help students integrate into the local business community for positive results.